Not since Stanley Thompson’s groundbreaking Rocky Mountain layouts opened in Jasper and Banff in the 1920s has another golf destination equalled Muskoka’s impact on Canadian golf course design. Just as Thompson established a template for mountain courses followed to this day, Tom McBroom, Doug Carrick and other top architects are using the granite outcroppings of the Canadian Shield to create a uniquely Muskokan design aesthetic that has propelled the Ontario tourist district to the forefront of Canadian golf. In the span of a decade, the Lake Joseph Club (1997), Bigwin Island Golf Club (2002), The Rock Golf Course (2004) and Muskoka Bay Club (2007) were each named the country’s best new course by Golf Digest, a record unmatched by any other Canadian golf destination. Muskoka’s rugged landscape has been drawing vacationers the roughly 200 kilometres north from Toronto ever since the district first opened to settlement in the mid-1800s. The love affair between Canada’s largest city and Muskoka is similar to the bond that exists between New York and the Hamptons or Vancouver and Whistler. Muskoka is the city’s essential summertime escape—a stress-reducing, rustic oasis with hundreds of resorts, approximately 600 lakes and more than 30 golf courses. Though golf had been played throughout the district for decades, Muskoka didn’t enter the high-end market until the 1990 opening of Deerhurst Highlands Golf Course at Deerhurst Resort in Huntsville. Typical of Muskoka’s courses, the routing of this acclaimed McBroom-Robert Cupp co-design rambles through forest and wetlands, and features several immense walls of granite. Thompson, the godfather of Canadian golf architecture, established his reputation in the even more rugged terrain of Jasper and Banff by clearing gaps through the forest to point golfers toward greens aligned with distant mountains, and by whimsically patterning his bunkers after the snow formations on their peaks. Today, in similarly dramatic fashion, architects are using Muskoka’s outcroppings of pink Canadian Shield granite to shape and accent golf holes. Like restored artworks, especially beautiful rock formations are cleaned with high-pressure hoses to make their colours more vivid. Spearheading Muskoka’s drive to become a premier golf destination is ClubLink, Canada’s largest owner-operator of golf facilities, which operates two championship courses in the district and another a short drive away. Clublink’s first Muskoka course was the award-winning Lake Joseph Club, a McBroom design carved through the hills and valleys of a hardwood forest at Lake Joseph Club Resort. One of Muskoka’s signature holes is Lake Joseph’s par-three eighth, where golfers hit from a wildly elevated tee to a valley green dwarfed by a giant wall of striated granite. McBroom exposed even more granite at Clublink’s Rocky Crest Golf Club, in the nearby district of West Parry Sound, where rolling fairways twist through a thrilling mix of towering fir trees and marshes. A clear signal of the coming of age of Muskoka’s golf product was the 2001 launch of ClubLink’sMark O’Meara Course at Grandview in Huntsville. For the first time, an internationally famous golf personality was hired to design a Muskoka course. O’Meara, the 1998 British Open and Masters champion, responded to the challenge by building a gorgeous 7,065 brute of a track that frequently forces golfers to hit shots over menacing rock faces. In 2002, Taboo Resort in Gravenhurst raised the celebrity bar even higher by signing Mike Weir to be the official spokesman of the Ron Garl-designed Taboo Golf Club, a challenging layout offering a roller-coaster ride through wetlands and a forest of birch, pine and balsam. O’Meara and Weir (whose promotional deal with Taboo has since expired) helped to sell golf in an image-conscious marketplace where the lavish summer homes of wealthy Torontonians and Hollywood celebrities, including Goldie Hawn and Martin Short, adorn the waterfronts of Lake Muskoka, Lake Joseph and Lake Rosseau, the three most coveted addresses. Nick Faldo’s firm, Faldo Design, has built courses around the world, but was hired to design The Rock Golf Club, in the village of Minett, as much for the cachet of his name as for his reputation as an architect. Faldo, a three-time British Open and Masters champion, built a course featuring tightly carved fairways, bold bunkers and multi-tiered greens. Another high-profile opening was Bigwin Island Golf Club, a Carrick design that won Golf Digest’s top prize in 2002. Unlike most Muskoka courses, which have been carved from the wilderness, Carrick built his course on top of a long-abandoned 18-hole Stanley Thompson layout at the site of old Bigwin Inn, a once famous resort on the Lake of Bays near Huntsville. Almost every hole at Bigwin (reached by motor launch from the mainland) offers glorious vistas of the Lake of Bays beyond the treeline. And in a nod to Bigwin’s proud heritage, the waterfront pavilion that was once the resort’s dining hall has been rebuilt to serve as today’s clubhouse. 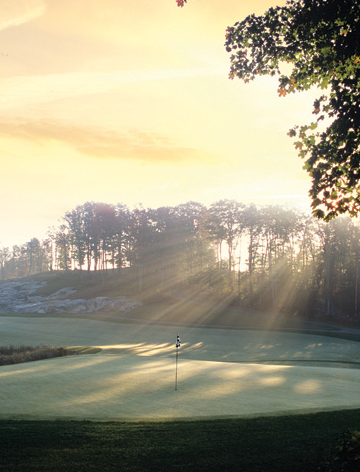 Carrick followed Bigwin with the Muskoka Bay Club, in the town of Gravenhurst, a stunningly beautiful layout that captured Golf Digest’s top spot in 2007. The highlight here is the par-four ninth hole, where golfers must thread their approach shot through twin granite towers standing guard over the green like billion-year-old sentinels. Though the recession slowed the building of new courses, 2011 saw the launch of Oak Bay Golf and Country Club, a Shawn Watters design in the town of Port Severn, near the shores of Georgian Bay. Absolutely unforgettable is Oak Bay’s par-three, 170-yard 15th hole, played over a marsh to a green perched atop a massive granite outcropping. Muskoka’s impressive roster of marquee courses has placed the district in competition with Prince Edward Island, Cape Breton, Mont-Tremblant, the Alberta Rockies, the Okanagan Valley and Whistler for dominance in the Canadian golf tourism market. Another key to Muskoka’s prominence is the district’s solid lineup of attractive and challenging courses ideal for golfers on tighter budgets. South Muskoka Curling and Golf Club, Muskoka Highlands Golf Links, Huntsville Downs Golf and Country Club, Windermere Golf and Country Club, North Granite Ridge Golf Club and the nine-hole Diamond in the Ruff will test the skills of even low handicappers. 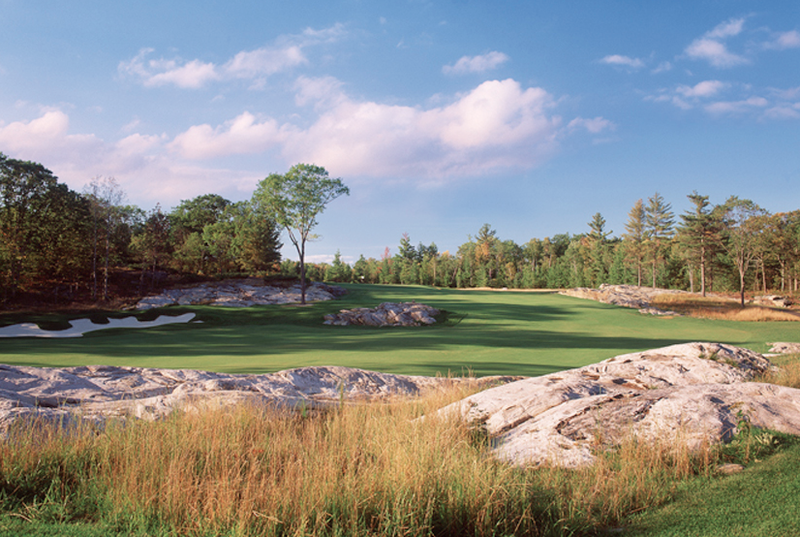 Muskoka’s wild landscape of pristine lakes and Canadian Shield granite has provided a canvas for course designs recognized as unique in the golf world.